My new year resolution is to eat/cook with more vegetables. The problem I face with this is, I buy lot of vegetables in a week and then they sit in fridge and pass their prime time. This weekend, after a very long time, I prepped all the vegetables – washed them, cut them into pieces, dried them and stored in boxes/zip lock bags in freezer or refrigerator. This is helping so much in fast cooking during weekdays and I hope this will also bring down the wastage. Now I have to figure out something similar with spinach(palak). 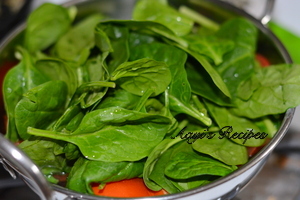 I buy big box of baby spinach from Costco. 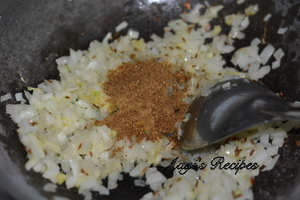 I make dal, paratha etc with it, but still have some leftover. Last week I prepared this palak paneer with almond paste. I called it palak paneer, because it had palak and paneer!. This is probably the closest to the classic palak paneer that my family will eat. I made it quite spicy, the way we like it. Many years ago, on a cooking show I had seen the addition of kasoori methi (dried fenugreek) to Palak paneer. 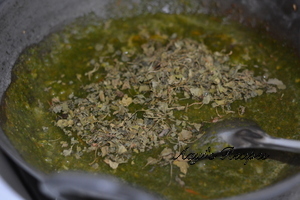 I followed the same to give it a bright methi taste. This is by no means traditional palak paneer (calling it a palak paneer may be a stretch! )n- I made it to suit our taste buds. 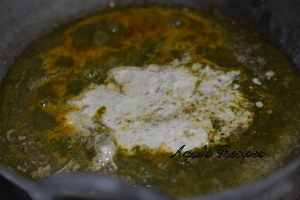 Check Anita’s Palak panir or Manisha’s Palak paneer posts for authentic versions. 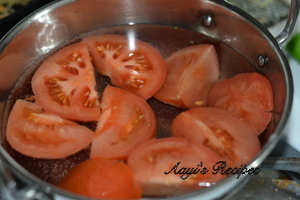 Blanch tomatoes in boiling water. 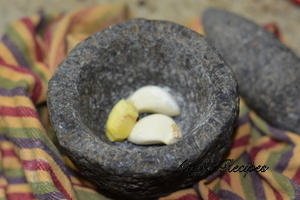 Make ginger-garlic paste. 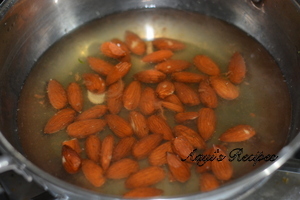 Blanch almonds. 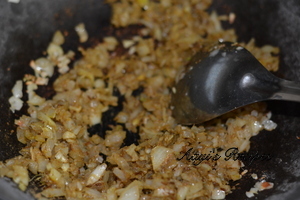 Fry onions with ginger-garlic paste. 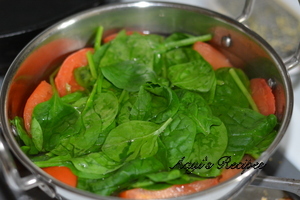 Add ground spinach-tomato paste, kasuri methi. Then add almond paste. 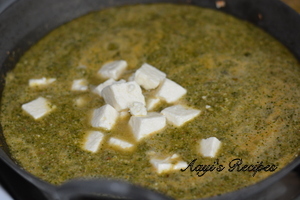 Thank You for describing this new version of Tradional Palak Paneer. 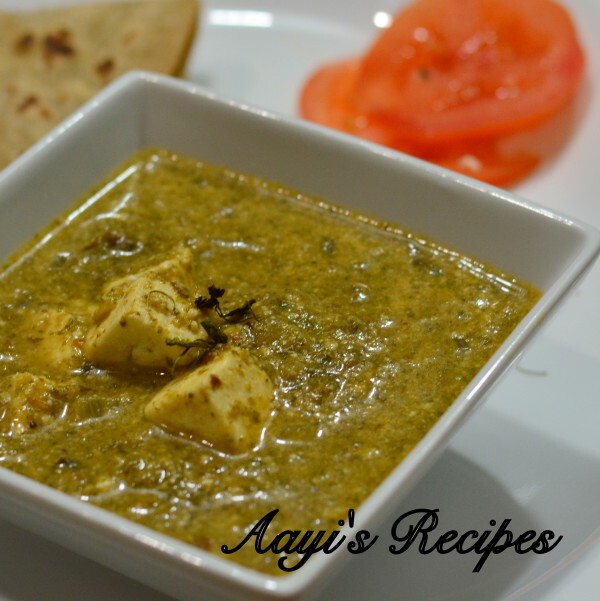 I am a big fan of Palak Paneer from a very long time and try this version also as soon as possible. Gravy is thick because of almond paste what we have taken and got rich taste to the gravy. This is nice comparing to palak paneer & delicious too. This looks awesome. Can we do some modification with curd or make it even spicy by adding something which doesn’t affect the base taste of this recipe. 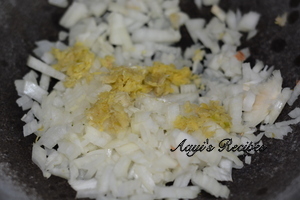 You can add more green chillies to make it spicy.